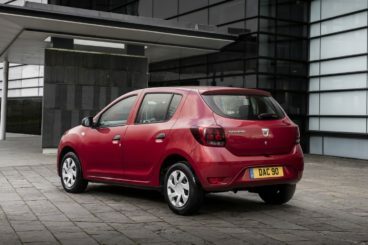 The new Dacia Sandero Diesel Hatchback has a starting price of less than £8,000 and offers incredible value for money. It’s affordable to run, boasts a huge boot and is super practical. Naturally, there are downsides to a car as cheap as this, but if you keep your expectations low, a dull design and a basic interior are things that most people shopping for cars at this price point could live with. The biggest question is this: If your budget can stretch further than a Dacia, is a Dacia really a worthy option? Join OSV as we take a closer look at what it’s all about with our 2018 Dacia Sandero Diesel Hatchback review. Dacia started as a state-owned company, but it’s come a long way. Find out more about the company’s history here. The Dacia Sandero has been designed to be as comfortable as possible, with driver entertainment an afterthought. Sure enough, the Stepway isn’t what you could call “fun” and it’s a shame that its steering is a little too heavy for the towns and cities – a place where cars like this are meant to thrive. Moreover, it doesn’t have much feel on the road. On the other hand, there’s plenty of grip on offer and the Sandero feels very safe, but body lean is an issue in bends. Occasionally, you might also notice some kick-back from the steering, which can undermine your confidence. That said, since this is a car that provides a hassle-free way of getting from A to B, we hardly think drivers will be pushing it too hard anyway. Doing so could ruin your enjoyment and your passenger’s enjoyment. Take it easy and the car complies. It’s laid-back, deals with most road imperfections well, and it’s a genuinely relaxing way of spending your time out on the road. There’s nothing inherently wrong with it, although some buyers might bemoan the fact that the Stepway is manual only. All models come with a rather notchy 5-speed manual gearbox and you can’t specify an automatic. In terms of the engines, the sole diesel engine has more pulling power than either of the two petrols. However, it’s also heavier and this can make the Sandero feel a tad nose-heavy. It’s a 1.5-litre dCi 90 unit that completes the 0-62 sprint in 11.8 seconds. Aimed at high mileage drivers, it doesn’t feel as breathless at high speed as the petrol engines, although it is fairly noisy and doesn’t sound as refined as many modern diesel power plants. That noise might not be too bad at first, but it could become wearisome on longer journeys. It’s also worth bearing in mind that the diesel model costs almost £8,000, while the entry-level petrol costs less than £6,000. It all depends on your priorities and needs, but if you’re a high mileage driver you’ll get your money back if you go for the diesel – eventually. At this price point, it’s pointless to even expect anything other than a very basic cabin. And that’s what you essentially have – but it isn’t as bad as you might be imagining. Basic cabins have come along way since the late eighties and in 2018, a budget-friendly cabin is perfectly liveable. The hard materials are a stark contrast to the soft-touch plastics of rivals, but the cabin “does a job” to use a popular phrase. The dashboard is functional and built to last but a lack of steering wheel and full seat adjustment on the entry and mid-range models might be a sore point for some buyers. The front seats are pretty basic but they do offer a decent amount of support. Moreover, the Stepway recently benefited from a facelift and now comes with a brand new four-spoke steering wheel, as well as some improved materials. Is the Dacia Sandero Diesel Hatchback practical? It’s very roomy for this price and we don’t have much to gripe about where its usability is concerned. Its boot measures 320-litres, which makes it one of the biggest in this class – and, incredibly, it also makes it bigger than the Ford Focus. Fold the rear seats and you can extend it to 1,200-litres. A wide opening is a bonus. 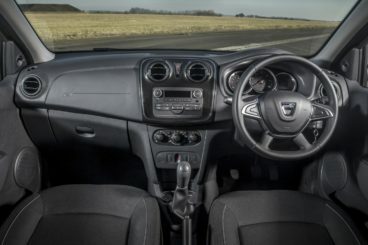 Other than that, the five-door Sandero makes it easy for anyone to access the rear seats, interior storage is very good and includes a deep glovebox, while visibility is also excellent, thanks to its boxy shape. Standard kit is very basic for the entry-level model; it’s fuss-free and no-frills. It’s got what you need – but nothing else. Most buyers have been snapping up the mid-range Ambiance model, which comes with Bluetooth, a digital radio, central locking, electric windows and air conditioning. The Laureate trim rounds the range off with a trip computer, a sat-nav, a seven-inch infotainment system, cruise control, a speed limiter and rear parking sensors. A reversing camera is optional. Safety-wise? It’s disappointing that the Stepway – like most Dacia’s – was only awarded 3/5 when crash tested by Euro NCAP, but it scored well for both child and adult protection. Its standard safety kit is impressive too, and includes seatbelt warning buzzers, airbags, electronic stability control, rear child locks, emergency braking assistance and anti-lock brakes. To find out more about the reliability of the Dacia, read our unbiased and honest assessment here. In terms of its running costs, the sole diesel engine is the most frugal in the range. This 1.5-litre dCi 190 unit manages returns of 80.6mpg and emits just 90g/km of CO2, which gives it a BiK rating of 20%. All models cost £140 a year to tax, while the diesel model sits in insurance group 10. You would have to do a lot of shopping around to find a car that offers as much value for money as the Sandero in 2018. It’s actually bigger than its rivals, which means practicality is good. Go check out the reviews – the Sandero has proven to be a massive hit with buyers. You’ll need very low expectations if you’re to get along with this car’s cabin. It’s among the poorest in this class on this front – if not the poorest. Let’s see how the car fares against its rivals in the comparison section of our 2018 Dacia Sandero Diesel Hatchback review. The Kia Picanto goes all the way back to 2004, a time when many of you probably didn’t even know Kia existed. 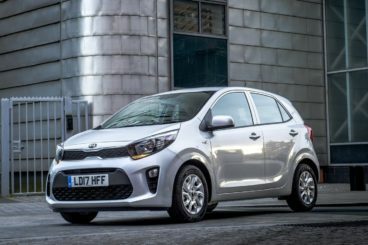 In 2018, anyone who’s on the lookout for a supermini usually always considers a Kia – and especially the Kia Picanto. It’s an excellent car that’s got a lot to offer, starting with its driving experience. Sure, it doesn’t offer the last word in driver entertainment, but it’s an absolute piece of cake to drive. Its compact build and light weight ensures that it’s very enjoyable when you want to go out and about for a mooch. It’s more rewarding to drive than last time, with Kia pushing its front wheels further apart. Its turning circle has been reduced, and tackling tight turns and congested streets is a cinch. In terms of its engines, unlike the Dacia, the Kia doesn’t offer any diesels. Instead, buyers have two petrol engines to choose from. The smallest of the two is a 1.0-litre unit that develops 66bhp and takes 13.8 seconds to complete the 0-62 dash. It’s lively and doesn’t feel out of its depth in the country or on longer trips. However, if you’re planning to ascend hills now and then, the 1.25-litre 84bhp engine is a better option. It covers 0-62 in 11.6 seconds and suits life on the motorway better. Running costs? Despite the lack of diesels, the Picanto is still cheap to run. The 1.0-litre engine returns 64.2mpg and emits 101g/km of CO2, while its BiK rating is as low as 19%. The bigger 1.25-litre engine, meanwhile, is good for 61.4mpg and emits 106g/km of CO2. Inside, Kia have introduced better quality materials this time around and its cabin feels less functional than last time. This could be key for buyers; while the Dacia is unashamedly functional and unlikely to change anytime soon, Kia have made a conscious effort to inject more style into the Picanto. It’s now easier on the eye, comfortable and a horizontal trim on the dashboard breaks up what is an otherwise grey mass. Of course, you’ll still find harder plastics here and there, too. Is the Kia Picanto practical? It gets as much out of its small dimensions as it can. Its cabin is more versatile than last time, and legroom is much-improved upfront. The driver’s seat still isn’t height adjustable, but getting into the right position shouldn’t be too difficult. The rear seats recline, rear seat legroom is good and passengers should be able to enjoy a relatively snug ride. The boot, meanwhile, measures 255-litres. The new Vauxhall Viva is cute, compact, affordable to buy and run – but it’s like a fish out of water once you take it outside the city. In urban settings, the Viva excels with its small engine. It’s lively and zippy, and body lean is well resisted. A city steering function lightens up the steering wheel even more, while Vauxhall claim that they’ve tweaked the car’s suspensions setup so that it’s now better able to cope with British roads. The Viva isn’t fun to drive, and it gets especially noisy on the motorway, but like the Dacia, it’s easy to drive. In terms of its engines, there’s only one available. This is a 1.0-litre petrol unit that feels right at home in the city. It covers the 0-62 dash in 13.1 seconds, which will be enough power if you’ll be using it mainly for the commute to work, the school run, or trips to Tesco. It comes with the option of an automatic gearbox, but we recommend sticking to the manual as automatic superminis are never easy to live with. Running costs? With the 5-speed manual gearbox, the Viva is able to return 61.4mpg, while specifying the 5-speed automatic bumps costs up to 62.8mpg. Inside, the Viva offers good value and its standard kit is decent. All models get a trip computer and cruise control, which is more than even the mid-range Dacia offers. 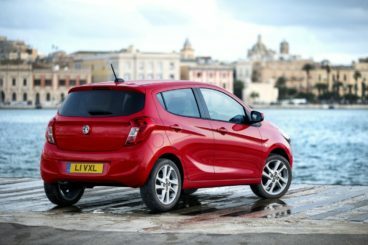 Design-wise, the Viva has been given a few of the funky touches that make the Corsa so appealing, while it shares the same glossy trim as the Adam. On the whole, the dashboard is smart and it’s one of the best in this class. Is the Vauxhall Viva practical? It’s spacious and all five adults who get into the car should be comfortable enough, even on longer trips. Headroom is especially excellent, while a low transmission tunnel ensures that even a middle-seated passenger shouldn’t feel too put out. The boot, however, measures a disappointing 206-litres. This is easily one of the most affordable and value for money cars on the market right now. It’s basic, offers a no-frills driving experience and zero desirability. On the other hand, it’s hassle-free, functional and practical nature is what some buyers will love about it. The Dacia Sandero Diesel Hatchback is also easy to live with and, thanks to a recent facelift, it even looks pretty good. Want more bang for your buck? Look no further.